An executor is an individual who has been appointed -- usually by a decedent -- to wrap up and distribute the decedent's estate upon his death. While a person can volunteer to be an executor, typically the final decision is made by the decedent prior to his death and provided for in his will. If you have been appointed to serve as an executor of an estate there are several advantages to serving in this capacity, but these advantages must be weighed against the risks inherent in the position. By serving as an executor you are respecting and honoring the final wishes of the decedent. Executors are usually chosen by a decedent for their trustworthiness and capabilities. If a decedent has chosen you to close out his affairs, he has given you a vote of confidence and implicitly stated that he believes you are the person best suited for the job. 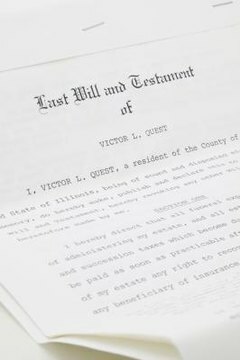 Can I Sell, Lease or Dispose of Property as the Executor of a Will? The duties of an executor range from locating and probating the will to accounting for and distributing any assets -- both personal and financial -- that the decedent left behind. Serving as a executor allows you to personally oversee every aspect of resolving the decedent's estate. You will have a complete accounting of the estate because you are in control of it, subject only to the decedent's will and judicial oversight. Every state, in its probate code, provides that executors may be compensated for the time that they invest in closing out the decedent's estate. Compensation varies depending on the size and complexity of the estate. Larger estates, with sophisticated investments, assets and debts, usually require more time and skill to resolve warranting higher compensation than a simple estate. The advantages of serving as an executor should be balanced against the potential disadvantages of the role. Closing a decedent's estate can be an emotionally trying or sad experience, particularly for those who have enjoyed a close relationship with the decedent. It can also be a time-intensive task that lasts for months. Finally, executors are considered fiduciaries which means that they owe duties of care and loyalty to the estate and can be held financially liable for any improperly awarded assets. You should accept the position only if you are committed to the role and feel you can properly handle the job. If you decide to not accept this position after considering the advantages and disadvantages of being an executor, alert the court promptly. The court will either tap an alternate executor named in the will or appoint an appropriate person to the position. Lynne, Robyn. "The Advantages of Being an Executor." , https://legalbeagle.com/8399902-advantages-being-executor.html. Accessed 24 April 2019.